William H. "Bill" Murdy was keenly interested in the adaptation and growth of plants in their natural habitat and also in his own garden, and that attunement to cultivation is an apt symbol of his life, one that leaves a legacy of service across Emory University and beyond. Murdy—dean of Oxford College emeritus and Charles Howard Candler Professor of Biology emeritus—died March 19 at his home in Oxford; he was 85. 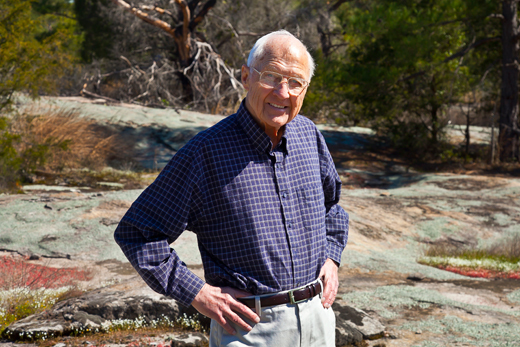 Murdy joined the Emory faculty in 1959 as an instructor in biology. He chaired the Department of Biology twice, from 1971 to 1974 and 1983 to 1987. In 1987 he was named Charles Howard Candler Professor of Biology, the same year he was appointed dean of Oxford by then Emory President James T. Laney. In 1990 Murdy received the Thomas Jefferson Award for his service to Emory. Oxford Dean for Campus Life Joe Moon writes in his book "An Uncommon Place: Oxford College 1914 — 2000" that when Murdy arrived at Oxford, he immediately sought to address facility maintenance, faculty salaries, and higher-than-acceptable student attrition. When he retired in 1999, says Moon, he left "an impressive legacy of plant improvement and expansion, record student enrollment, improved faculty and staff salaries, and better administrative linkage with the Atlanta campus." Under Murdy's leadership Oxford's visibility as one of "two doors" to Emory was raised, and by 1999, total applications to Oxford had doubled, and entering students' academic credentials had dramatically increased. Ties to the University were strengthened, with Murdy's initiative to establish a daily shuttle connecting the Atlanta and Oxford campuses. When he arrived in 1987, Murdy reinstated varsity sports, boosted student leadership programs, and led key property acquisitions, including what is now the Oxhouse Science Center, and extensive improvements to residence halls and the physical plant in general. The campus landscape received greater attention, especially the venerable trees of Oxford's quad. These were not the only trees whose preservation was ensured by Murdy's attention and care. In 1986, he and Eloise Carter, Oxford professor of biology, published a report entitled, "A Report on the Status of Forested Land of Emory University." Known more widely now as the Murdy-Carter Report, the landmark treatise assessed the location and status of Emory's natural forests, cautioning that the University's holdings included "unique, near-pristine hardwood forests with rare and diverse species" that should be preserved undisturbed. This report, said a writer in a 2004 Emory Report article, "continues to be a guiding force in Emory's land use and discussions." Murdy served as president of the University Senate from 1986 to 1987. ollowing recommendations made during that time, the Senate instituted its Committee on the Environment in 1990, and Murdy served on the ad hoc committee that prepared the committee's charge. Fourteen years after the Murdy-Carter Report, he and Carter teamed up again to bring attention to local flora, publishing "Guide to the Plants of Granite Outcrops" (Athens, Ga.: University of Georgia Press, 2000). Their book chronicles the plants of locations such as Stone Mountain and Arabia Mountain—rock habitats that contain many species found in no other environment. The book remains a primary resource for understanding and preserving these unique plants. When Murdy became dean, he and his wife Nancy moved to Oxford and lived in the Presidents' House, the historic home on Wesley Street just north of the Oxford campus that has served both Emory College presidents and Oxford College deans. Upon retirement the Murdys bought another historic home on Wesley Street, Hopkins House, and remained in Oxford. He was a longtime member of the Oxford City Council, and from 2005 to 2007, he served the city as mayor. He was a life member of the board of trustees of the Atlanta Botanical Garden, a trustee of the Nature Conservancy of Georgia, and a member of the Oxford College Board of Counselors and the Covington Kiwanis Club. He was a native of Fairhaven, Mass., who never lost his distinctive New England accent. He received a BS degree from the University of Massachusetts and a PhD degree from Washington University. Murdy's death leaves many friends and colleagues from both campuses to contemplate his numerous contributions. John Wegner, Emory senior lecturer in environmental sciences, knew Murdy and worked with him on the Campus Land Use Plan in 2005. Wegner says, "Bill was an important mentor to me and one of the most gentle men I have ever come across." Bill McKibben, Oxford professor of mathematics emeritus, who served as Murdy's first dean of academic affairs, adds, "During [my service as academic dean] I came to marvel at his many fine qualities: personal, moral and intellectual…His character and judgment were beyond compare. The patience, integrity and equanimity he showed in working with faculty and staff stand out in my memory as a hallmark of his administration…He was an optimist of the first order, and he was inspiring in his own characteristic unassuming way. I am grateful to have worked with a man of such great heart and mind." A memorial service will be held on Wednesday, March 26, at 11 a.m. in Old Church, located at the intersection of Wesley and Fletchers streets in Oxford.